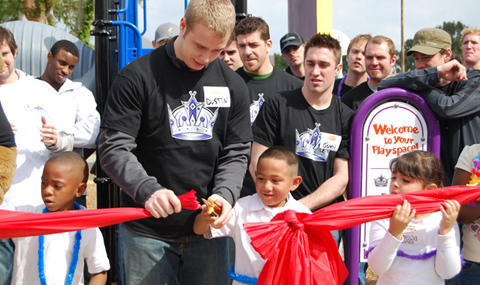 For a third consecutive year the Los Angeles Kings captain, Dustin Brown finds himself nominated for the NHL Foundation Player Award. This award is given to an NHL player recognizing their considerable amount of charity work outisde of the NHL and in their community. Brown is commited to charity as much as he is hockey. Brown is not like most of the rich who donate to charity, Brown gets involved with programs that he donates to even if that involves him getting his hands dirty and working with the organizations themselves. Brown has been involved with KaBOOM! a program that has built playgrounds in his hometown of Ithaca, New York and was head of a daylong build in Carson, California where he helped build and set up the playground along with rounding up some of his teammates to tag along with him. Brown partially funds the program himself by donating $50 a hit through out the season. Along with that Brown is involved in Kings Community Corner, which gives tickets to underpriveldged children, efforts to help childrens hospitals and hockey camps throught out Southern Califronia. Through his Twitter account Brown raise money for support in Japan by donating $1 for evey new follower her gained through a period of seven days, he raised $9,245 and presented it to the Red Cross in a ceremony before a Kings game on March 21st. Following Brown on Twitter (@DustinBrown23) one would see he frequently takes his charitable work with him from day to day. He oftens pays for the people behind him in line whether it be in a drive thru or at a store, an action he calls Make My Day. Brown is deserving of this award after being nominated but not winning the award the two previous seasons. The winner of this award and the rest of the NHL awards will be presenented in Las Vegas on June 22nd.